The PSNI have named a man who died in police custody on Monday as 26-year old William Young. 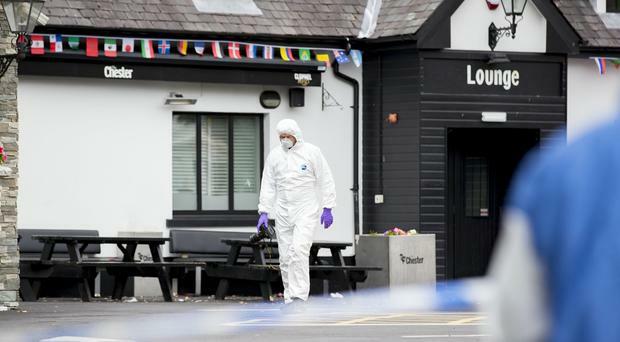 Police are continuing to appeal for witnesses following a disturbance at licensed premises on the Antrim Road in north Belfast at around 9.30pm on Sunday July 8. On Monday, the Chester Bar was sealed off while police forensic investigators examined the scene. Police are not looking for anyone in connection with Mr Young's death. “Tragically, William Young, a 26-year-old man from the North Belfast area, arrested following this incident, died later following medical treatment while in custody at Musgrave Police Station in the early hours of Monday 9 July," Detective Inspector Stephen Harvey said. "Following a post mortem examination, I can now confirm that the police are not looking for anyone else in connection with the death of Mr Young, however, the PONI investigation is continuing at this time. “As is normal procedure, the office of the Police Ombudsman was informed of the matter and has begun an investigation." Detective Inspector Harvey appealed for anyone with mobile phone or dashcam footage of the incident to come forward. “The police investigation into the circumstances surrounding the disturbance is ongoing. While I would like to thank those witnesses who have already come forward, I am again appealing for anyone with any information which could assist detectives with our enquiries or anyone who has mobile phone or dashcam footage of the incident, to contact us at Musgrave Police Station on 101 quoting reference number 1561 of 8/7/18," he said.